Vintage jewelry and clothing do not have boundaries in fashion. It’s always “in,” as part of an ensemble or as a statement piece. Why? Because it carries a memory, a story, and a history. Once, I meandered through the Paris Flea Market for hours, gazing in amazement at the ornate and lavish mirrors, chandeliers and tapestries that exceeded my tourist pocketbook by hundreds or thousands of American dollars. Still, I yearned to take something beautiful and authentic home with me, that represented The City of Lights. I turned my gaze down to the tables within the stalls containing tiny trinkets that were just as sparkly, but on a smaller scale. I sorted through earrings, charms, silverware, chains of solid gold, silver or bronze. I was ecstatic when I found a quarter-sized St. Thomas Medal that was perfect to add to my silver chain. I knew St. Thomas represented a “protector” and I thought that perfect for accompaniment on my journey home. It intrigued me because I knew it was previously worn b by someone in Paris and my imagination ran wild with who that person could be…a Queen, perhaps? If you are lucky enough to inherit real jewels from your mother or someone, that’s great. If you still love the look and want to find reasonably priced vintage jewelry or knock-offs, you are in luck. Often, high-end department stores are pricey in both authentic or vintage inspired pieces. Try local consignment shops or estate sales. Ask questions regarding your articles. Store owners usually know the history of most items. I recently bought a dusty blue ring from a local consignment shop, took it to my jeweler and he shined it up, and it has become a show-stopper. If you are a “stay in pajamas and shop from home”-type, Etsy and local or neighborhood swap or shop sites are excellent. 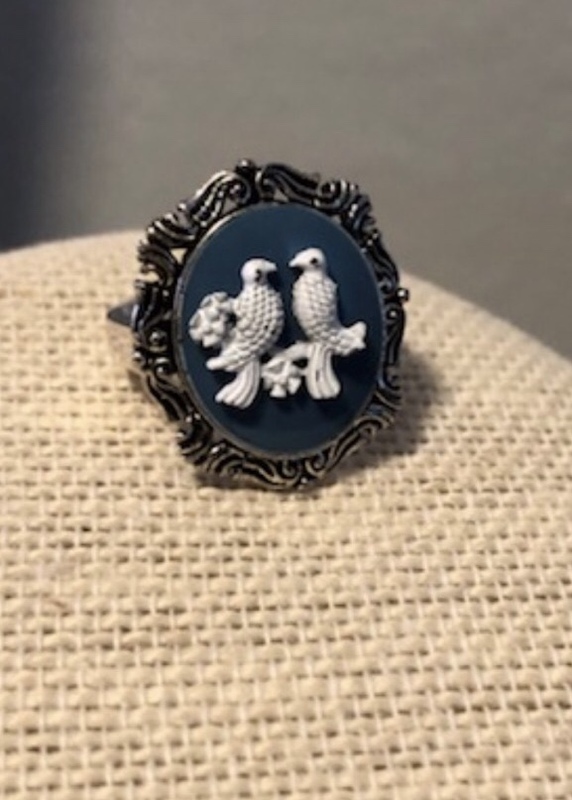 The bluebird ring that I found on OfferUP (a resale site) was three dollars and is inspired by very pricey, rare, English Wedgewood. The seller, Alicia Adams told advises vintage-inspired jewels usually stay current and are good sellers. There are always amazing finds in your mother, aunt or grandmother’s jewelry boxes whether authentic or costume, wearables from a by-gone era hold their own and spark a sense of honor in the person wearing them, as well as curiosity in those that see them. 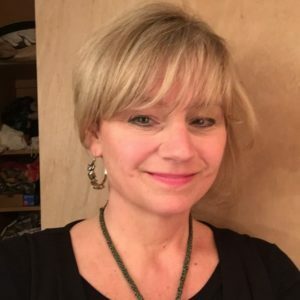 Shelly Johnson is a Metro-Detroit Freelance Journalist that is impassioned with curiosity to learn. Her personal profile stories of fashion designers and artists are her favorites, because they inspire her to stay current and creative in her own wardrobe. As a busy mother of three, college-bound boys, Shelly is young at heart, loves people and running and gets inspiration from nature, travel and timeless objects of art. She has written magazine and newspaper columns on fashion, as well as interviewed local and national fashion designers to understand many creative aspects of the craft. She considers fashion to be an adventure and is intrigued by the hunt for that perfect statement piece or elegant and timeless garment or jewel that tells a story of it’s own. She admires the endless freedom of expression in fashion as a wonderful affirmation of individuality and culture. Although Shelly loves simplicity, the sparkle of all things Parisian speak to her soul. Her favorite colors are red and orange.